Virtual reality is the tech topic du jour, with nearly every major hardware and software company (or one of their partners) looking into it in some capacity. Time will tell if this is just a fad or something that will truly change the way we interact with technology, but Google is hedging its bets. In addition to the growing Cardboard VR platform, a few user-facing changes in the second developer preview of Android N point to more robust support for virtual reality in the future. 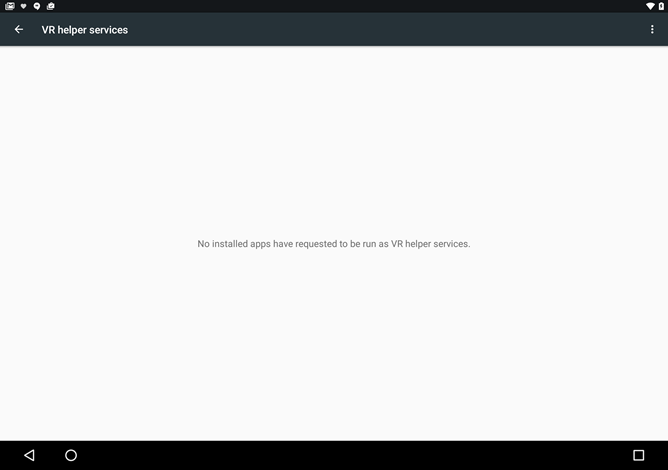 Ars Technica spotted a new "VR helper services" screen hiding in the Apps menu of the latest developer preview. It doesn't do anything at the moment, but since the menu is adjacent to items like the Notification Access or Device Administrators option, it seems likely that any apps taking advantage of a similar API would need to be manually enabled. The settings screen doesn't offer any particular clues, and the linked help article is blank at the time being. Ars dug into the settings strings and found references to a dedicated "VR mode," which might indicate something like a more complex version of Google Cardboard's stereoscopic display. Rumors about Google's expanded plans for virtual reality have been making the rounds for the last few months, notably in a Wall Street Journal article that claimed the company was planning a stand-alone VR headset that wouldn't need a connected or docked smartphone. Nothing is concrete at the moment, but it might be prudent to keep an eye out for new VR developments at the Google I/O developer conference next month. [Weekend Poll] Galaxy S7, LG G5, Or HTC 10?